Voila! 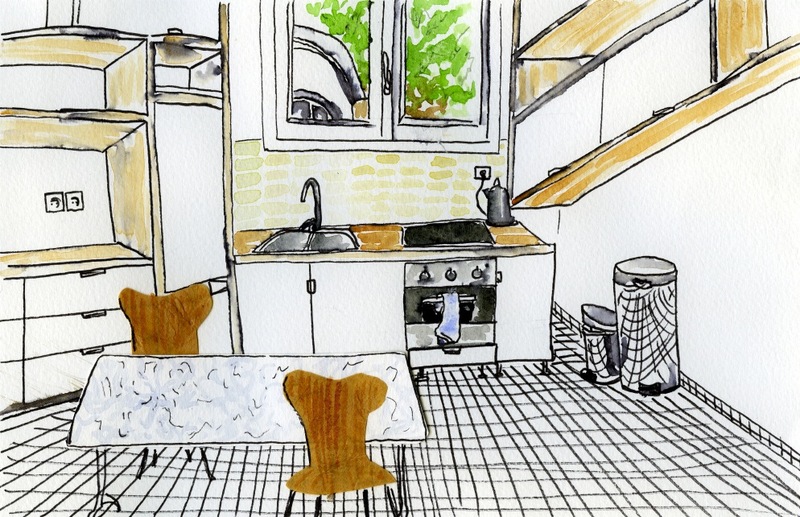 An illustrated taste of our new souped-up kitchen! And just a glimpse into our new pseudo-Scandanavian love nest. Since this is my first time living in an all-new place of my own, I have taken an obsessive-compulsive reacquaintance with cleaning. And the thought of packing all of Paris into our crib for a housewarming has me reaching for the Ajax. Nevertheless, the past week has been a marathon of calm, mini-housewarming events. Much to my chagrin, a housewarming does not translate directly to chauffage de maison. Instead it translates to pendaison de crémaillère. After grilling my husband about its origins since we packed our first cardboard box, I finally got an answer this evening. But like a lot of things in France, it goes way, way back in time. From what I can understand, pendaison de crémaillère is the hanging of the chain which holds a pot of soup over a fire. Straight up Medieval double, double toil and trouble! That sounds like a big old mess. I’d rather turn up the heat and call it a chauffage de maison.